Metatypical basal cell carcinoma is also referred to as basosquamous cell carcinoma. This is a dangerous and a rare form of skin cancer. The disease process is more aggressive, likely to recur, and prone to metastases. While the likelihood of developing this type of skin cancer increases on areas of the body that have had years of sun exposure, metatypical basal cell carcinoma might also form on non-exposed regions. Early detection and treatment is vitally important. Metatypical Basal Cell Carcinoma is a unique form of skin cancer, in that multiple combinations of cells are found within the actual malignancy. Because of this, lesions may vary in size and appearance. There are no specific features to determine whether a lesion is a metatypical basal cell carcinoma or another kind of basal cell carcinoma. The diagnosis is made after biopsy. Essentially, anything that appears as a red bump, rash or scab-like marking (whether raised or flat), should be checked, especially if it stays for over a period of 3 weeks or recurs (comes and goes). If your dermatologists suspects this skin cancer, the first step will be to order a biopsy. If metatypical basal cell carcinoma is present, complete removal of the lesion is necessary. Mohs micrographic surgery performed by a board certified surgeon is one of the most effective means of ensuring complete tumor removal. The method was developed by and named for Dr. Frederick Mohs in the 1930s. The treatment involves removing the abnormal cells from the mass one layer at a time. Each layer is then immediately examined under a microscope. A laboratory technician prepares the specimen by cutting, mapping and staining the cells. The layer then undergoes freezing and further shaving into extremely thin slices. 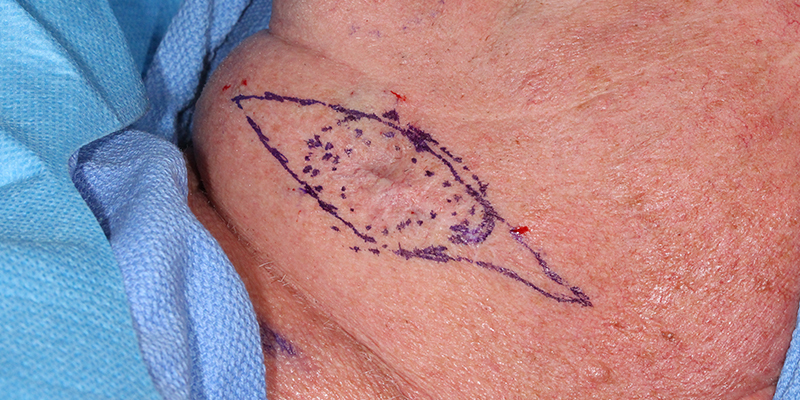 The technique enables surgeons to more effectively identify the margins of the mass (the area where the skin cancer stops). Surgeons repeat the process until specimens no longer contain malignant cells. There are certain precautions that can be taken to protect the skin against damage from over exposure to UV rays. They include, avoiding peak hours in the sun, covering up with a sun hat or protective clothing, and applying sunblock regularly - every two hours throughout the day if you plan to be outside. Since metatypical basal cell carcinoma can form on areas of the skin that are not exposed, the next best form of prevention is to be aware of your body and the warning signs of skin cancer. This will help you spot a new lesion relatively quickly if one happens to occur. Early detection can save your life when it comes to this very rare and dangerous skin cancer. Remember, metatypical basal cell carcinoma will look similar to other forms of skin cancer until it is examined under a microscope. Practice your at home monthly skin checks, maintain a diligent schedule with your dermatologist for professional skin exams, and know the warning signs of skin cancer. If you spot anything suspicious, schedule an appointment with a dermatologist immediately.